The Borough of Denver, Lancaster County, recognized the need to update their Water and Sewer Ordinance and take advantage of new developments in available materials and technologies. Hanover Engineering was retained by the Borough to aid in updating their existing ordinance to include these new developments in water and sewer materials and processes, and to eliminate references to materials and practices no longer considered acceptable per industry standard. Hanover Engineering worked closely with the Director of Public Works and Borough Officials to review specifications and details and standards, and to develop ordinance language that fulfilled both regulatory and community requirements. 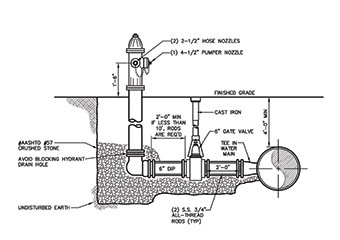 An updated version was drafted with various Hanover Engineering employees lending their expertise in associated disciplines, including utility design and construction, as well as municipal engineering and planning, producing a set of detail drawings to augment the written document, rendering uniformed engineering design standards and drawings for all sanitary sewer projects and water distribution system projects within the Borough. A final Water and Sewer Standard Specifications was presented and Denver Borough Officials adopted this document in February of 2005.